A Girl and Her Scout: Artist Highlight and Giveaway: White Bear! Artist Highlight and Giveaway: White Bear! Anybody know what time it is? HOLIDAY SHOPPING TIME!! That's right folks, the holidays are upon us, that's why I am super duper excited to introduce you to Lindsay from White Bear who is incredibly inspiring and is hosting a giveaway for you lovely and creative readers AND is giving us a code for FREE SHIPPING!! Her shop is filled with uber unique and perfect finds for the holidays and great accessories for yourself for some festive holiday partoes so be sure to hop on over! Check out her coolness below and leave a comment to win! Hi Lindsay! Welcome! Tell us a little bit about yourself and your fun accessories. Well hello there! Thank you so much for having me. This is my first interview so excuse me if I get all giggly and start to ramble...I'm pretty excited. Anyhow, a little about me...I am a 26 year old native New Yorker (yes, Manhattan...) who moved to sunny Miami Beach almost three years ago. It was too cold for me up there, so I opted for the warmer life. I was a professional actress and dancer since age three but decided to take a break from that crazy life and concentrate on my other love, jewelry. My mother had her own accessory company when I was a kid which got my sister and I into creating fun things at a very early age. I've been making my own jewelry for about 15 years now! Only recently did I finally start selling my creations because I got tired of my friends saying, "You need to start your own company! We love your jewelry too much!" So, here I am.... Creating, selling, living and loving. I reside on the ocean with my puppy Chloe and my amazing boyfriend John, (who is a chef!) Yeah, life is good. So as for my accessories, well I do a little bit of everything. I make beaded earrings, make headbands of all sorts, I dabble in feather extensions and my new favorite thing is LACE! I think it is so simple and girly but can be made into something so extravagant and exotic. The versatility it provides is extremely exciting for a designer. 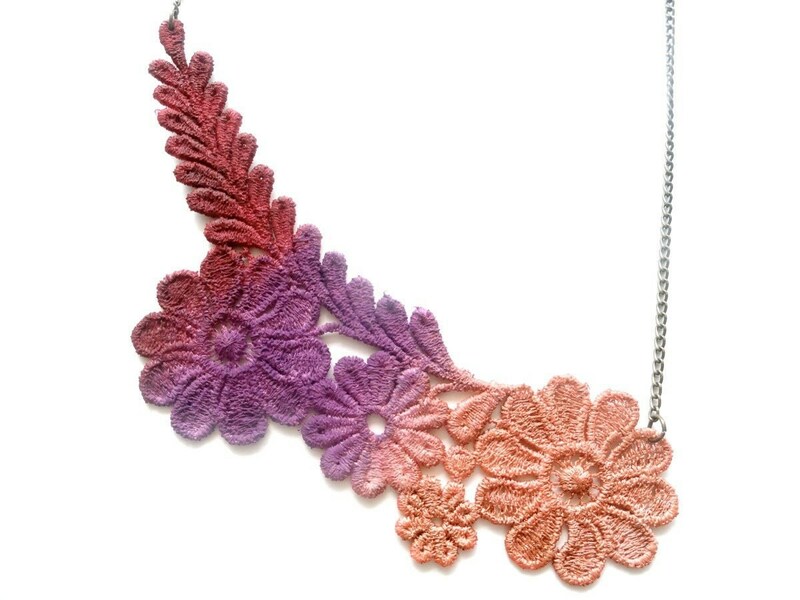 I hand paint all of my lace and try and create a new and interesting statement piece that no one has ever seen before! Besides all of the accessories you have in your Etsy store, what else do you like to do? Since I live on the water, we are always on the beach or in a pool! It's really too hot here not to be! I also love photography, interior decorating, fashion, website designing, dancing, singing, I'm starting to do real estate, promotional modeling, event planning...yeah I kind of do a little bit of everything. I'm weird and ambitious like that lol. I'm a rockstar. What first drew you to making accessories? I am a creative person, through and through. Whether it's acting on a stage, singing karaoke at a local bar, helping a friend decorate an apartment or doing a photo shoot of my jewelry...I am ALWAYS creating. Art is all around us and it's just too much fun to not be making something beautiful constantly! Designing jewelry and accessories is a fantastic way for me to get all of my built up creative energy out there for the world to enjoy. 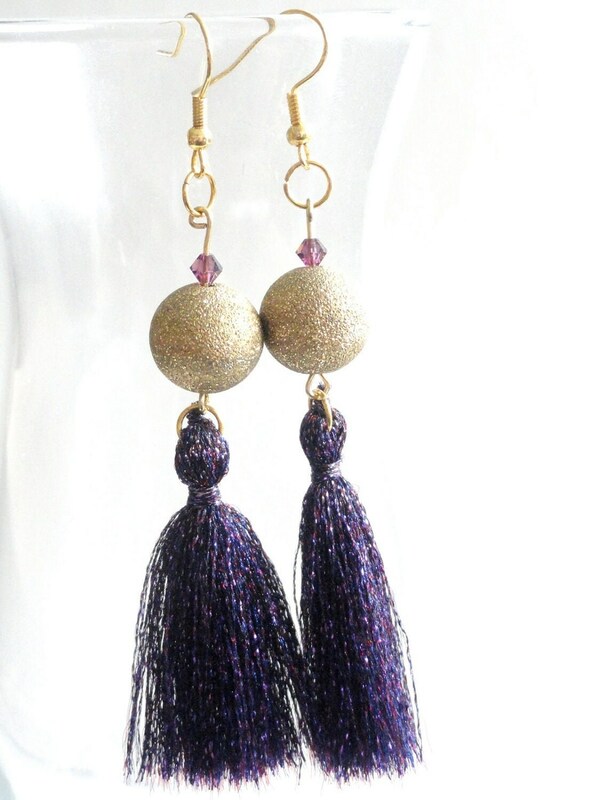 Tassel Earrings- SO great for Holiday Parties! If something isn't working, find out why and change it. My motto in life (which many people think is silly, but it works for me...) is "never be satisfied." There is always room to improve something. Take different pictures, think like a buyer, find your niche, try different ideas. At first I wasn't getting sales, so I thought to ask around for suggestions, for help. I was told to change up my photos on Etsy because they weren't clear and bright enough. I did what was suggested and honestly, it was like magic. Business began to pick up instantly. So if something isn't working, if you aren't happy, if the sales aren't coming in...it's usually for a reason. Ask for help. Change it up. Live life on the edge. It can't hurt! In addition to such inspiring words, White Bear (such a great name!) is hosting a giveaway here at A Girl and Her Scout! 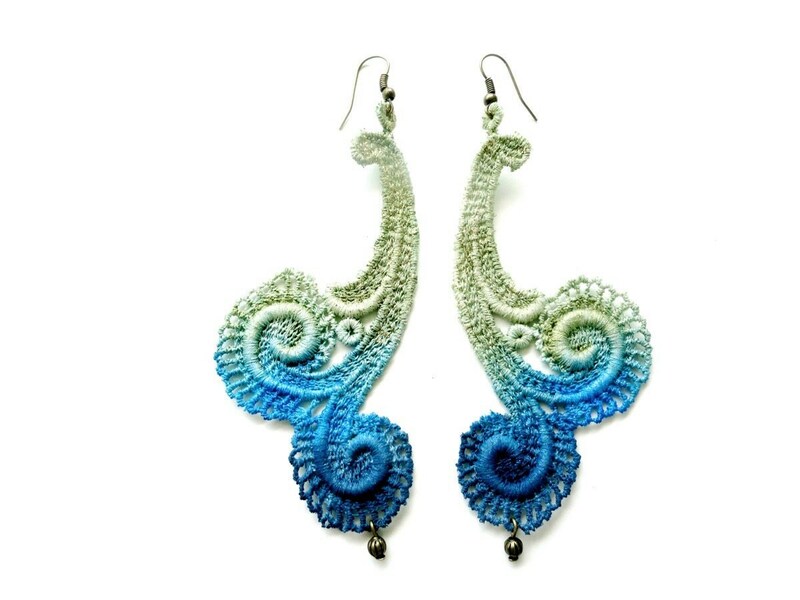 Lindsay will be giving away these fabulous lace earrings in any colors you want! The winner will be chosen (via a random assorter) on December 1st so be sure to get in your entries by then! To enter, head over to her Etsy Store, White Bear, and leave a comment here about your favorite item(s). Additional entries for: 1) becoming a first time follower of A Girl and Her Scout 2) Posting this giveaway with a link to my blog on your blog 3) Posting this giveaway with a link to my blog on your facebook and/or twitter 4) “Hearting” or adding White Bear to your “Favorites” on Etsy and/ or 5) making a purchase out of her store (one entry for every purchase) Be sure to leave a new comment for each additional entry! Don't forget, you can get free shipping over at her shop! Use coupon code "girlscout" to receive that wonderful discount. It's what's so annoying about shopping on the internet right?! Can't stop you now! I posted your giveaway on my blog as well.